Welcome to the 11th issue of the Yee Fung Toy Global Village Voice, an electronic newsletter for the World Yee community. In this issue we are featuring celebrations of the annual Spring Banquets from associations around the world. Of special interest is the addition of new Southern California YFT web site to our World Yee Yee web family. 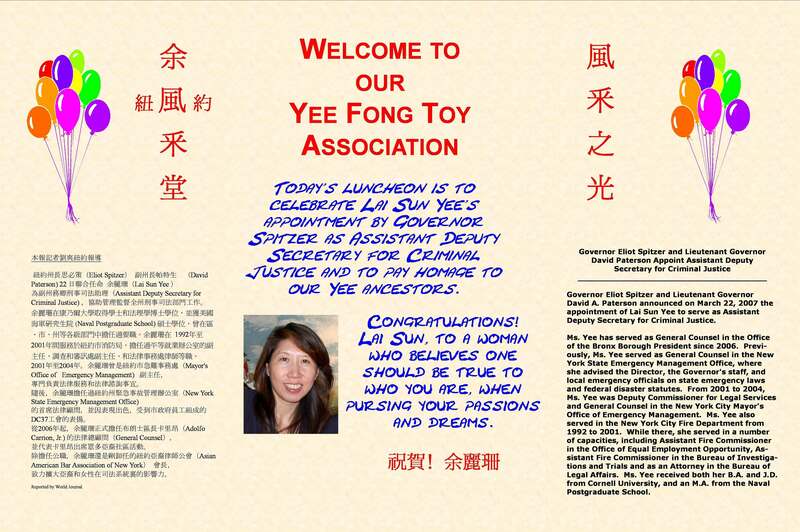 It's no secret that there are many talented individuals in the New York Yee Fong Toy Association. Quite often these individuals shy away from publicity but sometimes it's unavoidable. 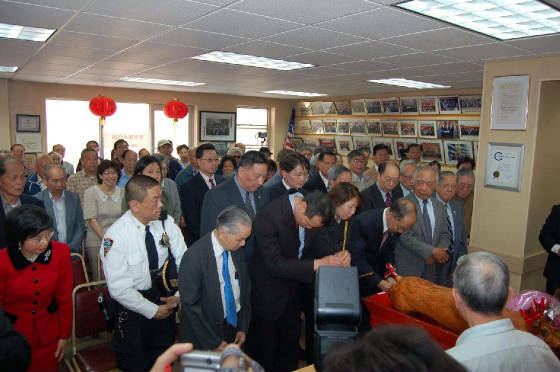 On February 11, 2007 we had the honor of having Deputy Inspector Gin Yuen Yee and his family come up to our hall to pay homage to Ah Goong. They also had a roast pig delivered. 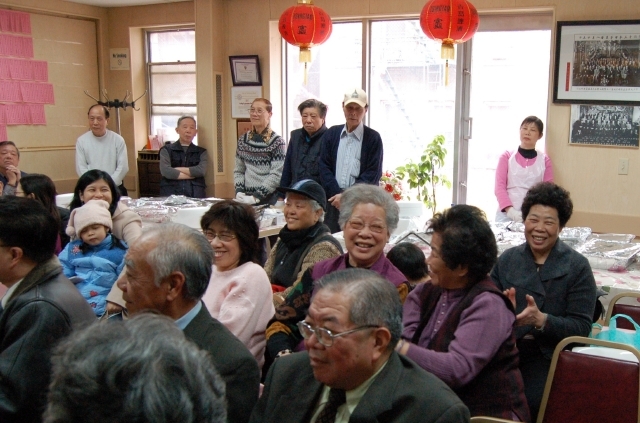 To his surprise, Deputy Inspector Yee was greeted by over 100 well wishers. 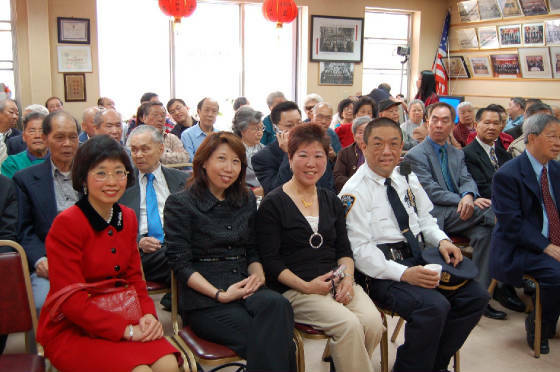 Gin Yuen will be the new police commander of the Fifth precinct in Chinatown on February 15th. His NYPD career started in 1980. Gin advanced to be Sergeant, then Lieutenant and finally Deputy Inspector for the Emergency Service Unit. With his 27 years of service, we are confident that he can lead the precinct and deal with the various Chinatown issues. Deputy Inspector Yee succeeds Deputy Inspector Michael Lau who retired at end of January. Many community leaders, cousins from the Mah and Tse associations joined members and family for this ceremony. Not often do we have so many fill our hall to standing room. After the customary rituals, President Kenneth Yee spoke briefly to introduce Deputy Inspector Gin Yuen Yee. Gin Yuen also spoke briefly to thank everyone for coming and for their well wishes. 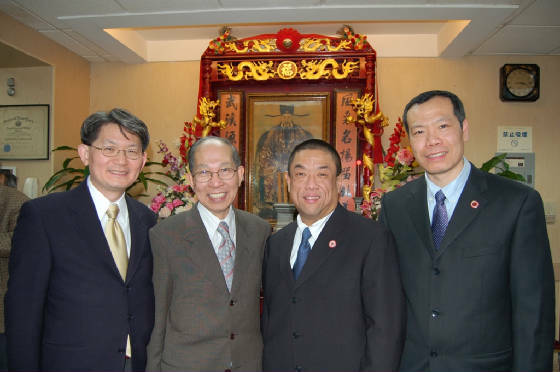 CCBA President Eric Ng, Grand Elder Wai Hing Yu and Lin Sing Association President Justin Yu then gave congratulatory speeches. Vice President Gong Sum then delivered a few words of thanks for the guest. Deputy Inspector Yee handled the limelight as expected. Dealing with all the reporters' questions and photo opportunities can be daunting. Finally Gin and his wife Miriam had some time to enjoy the buffet luncheon given in their honor. Due to short notice, many missed this event. 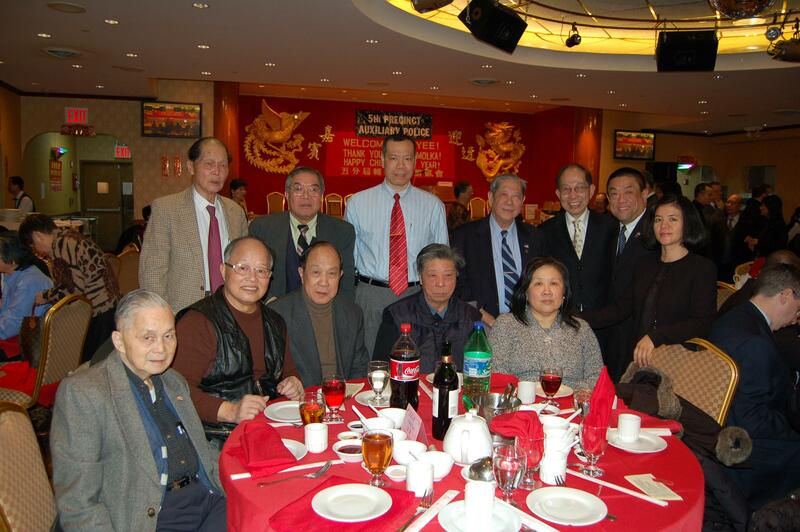 Congratulate Deputy Inspector Yee at our Spring Banquet on March 10th. 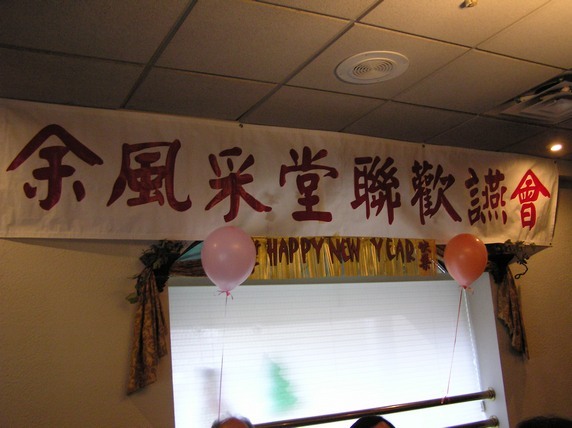 On February 15, 2007, the 5th Precinct Annual Chinese New Year Party was held in Golden Bridge Restaurant. A group of us from the New York Yee Fong Toy Association had the pleasure of attending this event. Unlike past events, this year the 5th Precinct has a new Commanding Officer, Deputy Inspector Gin Yuen Yee. As an attendee, it was truly an honor to have the surname Yee. 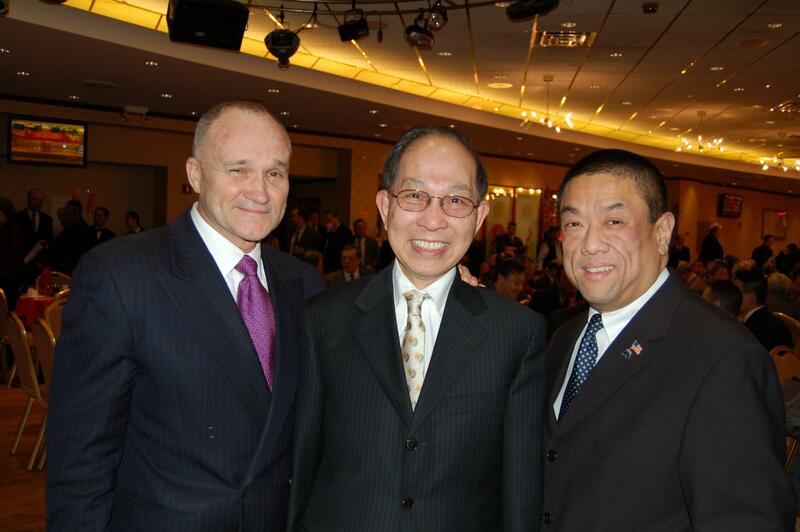 President Kenneth and I also had an opportunity to meet NYPD Commissioner Raymond Kelly. It was Gin Yee who made this possible. We also want to thank our host, 5th Precinct Auxiliary Police Unit under the leadership of Auxiliary Deputy Chief Shuck Seid, for making our group feel so welcomed at this event. Shuck kicked off the celebrations by welcoming and wishing everyone a happy, healthy and prosperous New Year. There were many community leaders, dignitaries, past Commanding Officers of 5th Precinct and VIPs in attendance. 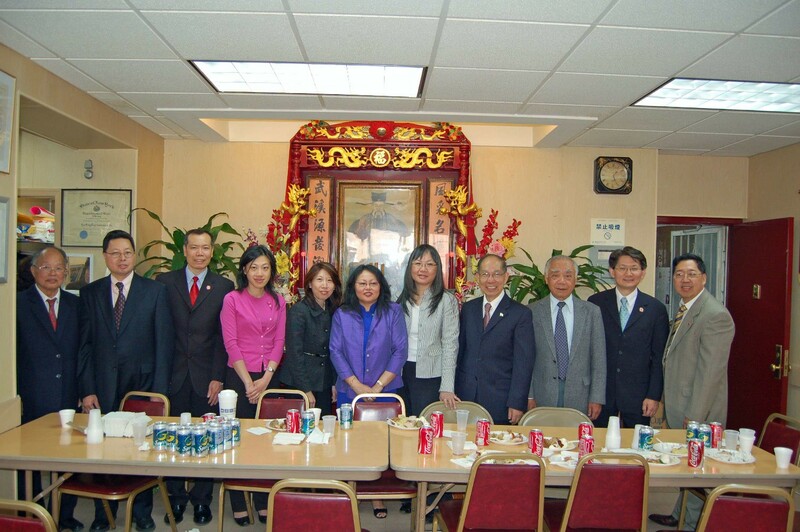 Noticeable ones were Commissioner Raymond Kelly, Ambassador Andrew Hsia of the Chinese Culture Center of T.E.C.O. in NY, and CCBA President Eric Ng. They all gave congratulatory speeches. Afterwards, Shuck proceeded to award Certificate of Appreciations to a group of organizations for their continued support. President Kenneth graciously accepted this unexpected honor for our association. Monetary support is very important for the operation of this Auxiliary Unit. During this event, raffle tickets were sold to raise funds. Many prizes were given to the raffle winners. I for one was lucky enough to hold the ticket for an IPOD shuffle. After all, this was one very memorable evening with good food, entertainment and company. Recognition for supporters as well as the organization receiving support is very important. 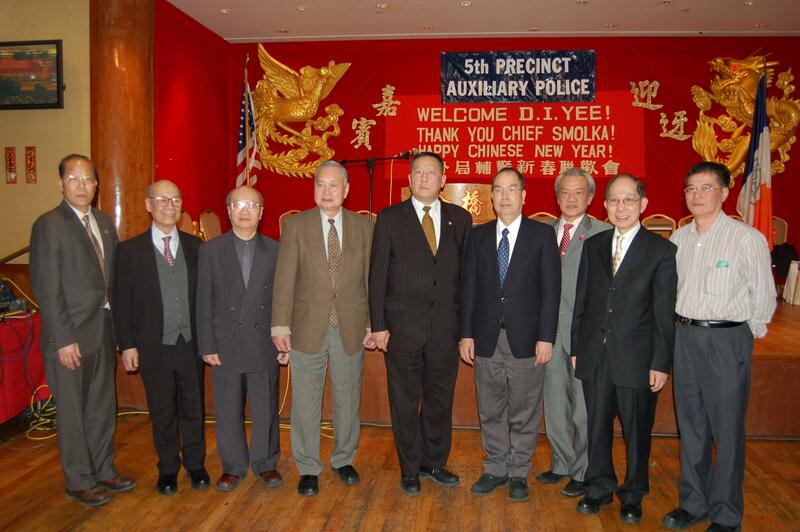 We wish continued success for the 5th Precinct Auxiliary Police Unit and Deputy Inspector Gin Yee. We all need a little "CPR", courtesy, professionalism and respect - the motto of NYPD. By working together, we can build a better, brighter tomorrow for all. 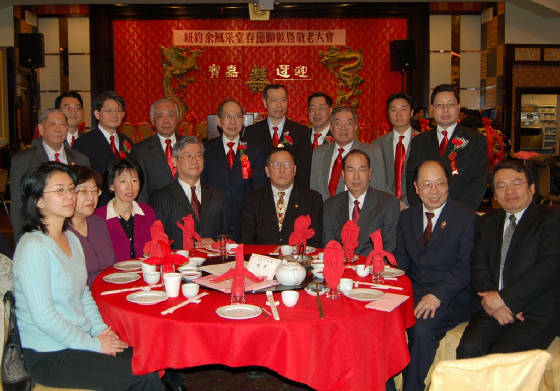 The 2007 annual dinner was held at the New Kowloon Seafood Restaurant on March 1. 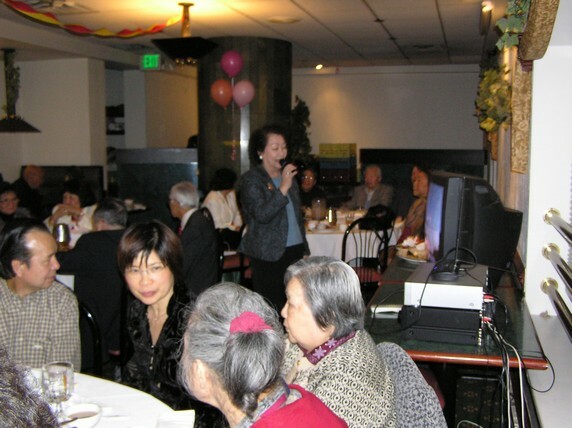 This year's dinner was enthusiastically attended by over 80 individuals including members of the Seattle Chapter and ten guests from Canada's (Vancouver) Yee Fung Toy Association. 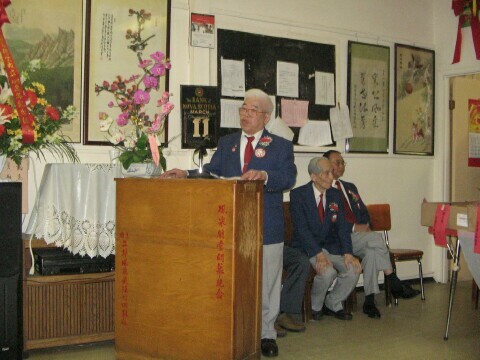 Kit Fung Yue, Seattle Chapter Secretary was the master of ceremony, following by greetings from Michael Kwok Keung Yee, President of the Seattle Chapter and Kim Gee Yee, President of the Canada Yee Fung Toy Association. 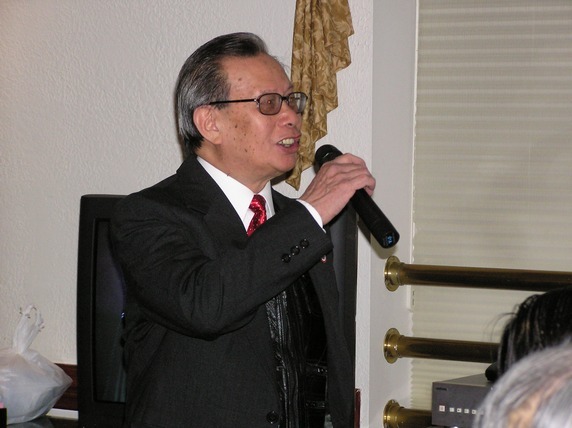 U.S. West Coast Grand Advisor Uncle James Yee gave the "Thank you" speech. 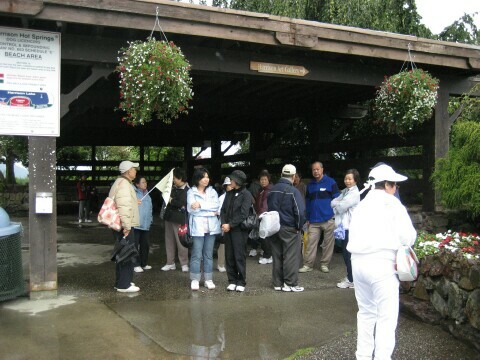 Seattle member Gordon and Joyce Yee generously donated a coupe dozens of tennis tee shirts as gifts for the attendees. Fred Yee, Advisor for the Seattle Chapter, distributed copies of the Spring Edition of the Yee Fung Toy e-Newsletter. 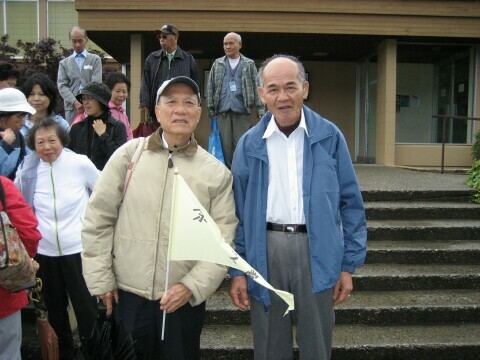 Credits are due to Jim and Martin Yee of Canada for helping with the production of the newsletter. Jim Yee gave a brief review of the progress of the World Yee Website project. 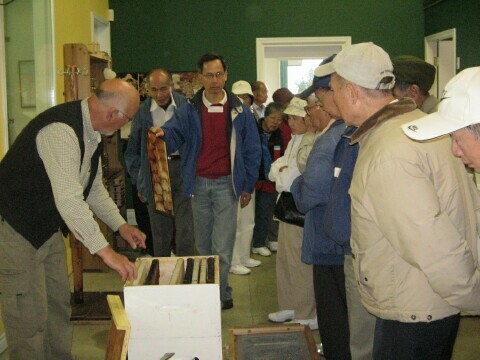 Among the attendees were a number of first-time participants. Many younger members of the association also took time to attend. With good food, great spirits and wonderful company, the evening was an enjoyable evening for all. We all look forward to next year's dinner. 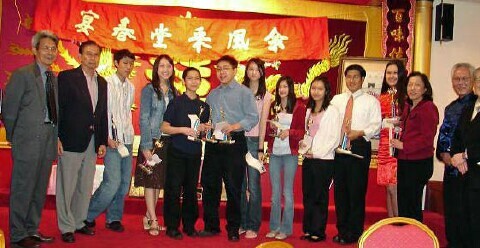 Houston Yee Fung Toy Association held its 19th Scholarship and New Year banquet at the Aloha Diner （百利海鮮酒家）on Saturday, March 3, 2007. Eighteen tables were reserved for the occasion. In attendance were People's Republic of China Houston Consulate General office Deputy Consulate General Fang Li （中國駐休斯敦副總領事房利）, Consul Gao Lijuan（僑務組高麗娟領事）and Consul Zhou Ding （僑務組長周鼎領事）. Also present were Michael Ger（台北經文處副處長葛葆萱）from Taipei Economic and Cultural Office and Yan Shi Wing （僑教中心副主任閰樹榮）of the Chinese Cultural Center. 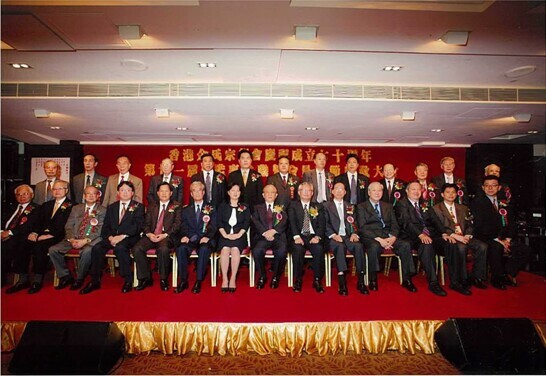 Chairman Frank Yu （余頌輝）made the State of the Association report. 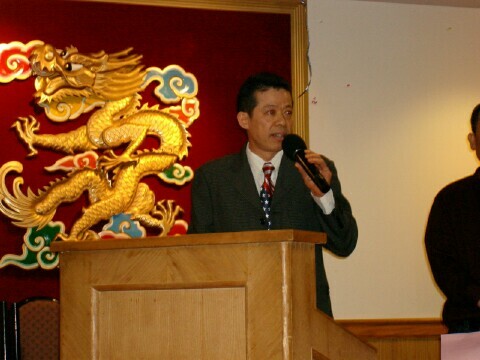 The tri-annual Yee National Conference （余氏懇親大會) was held in Monterey Park, California （羅省蒙特利公園市）last August and that the next national conference will be in New York in August 2009. The World Yee Conference will be held in Kuala Lumpur in Malaysia （下一屆世界余氏宗親會懇親大會將於二零零九年在馬來西亞吉隆坡舉行）, most likely in November, the same year. Any Yee members and friends are welcome to attend. The local website: www.yeehouston.org is linked to the World Yee website and the World Yee Global Report. Readers are encouraged to click the links in blue to find out the instant news of Yee chapters around the world. The presence of the People's Republic of China Houston Consulate General office representatives adds a new dimension to our annual gathering of the Yee clans and friends. We received multiple congratulations to having them attend dinner for the first time in our history. During dinner Chairman Yu casually made the remark that he would be leading a group to explore Qinghai-Tibet this fall. Whereupon Deputy Consul General Fang said he would be delighted to sing a Qinghai folk song: The Little Lady from Far, Far Away（在那遥遠的地方, 有位好姑娘）. Fang's solo performance was stellar; but the makeshift chorus to complement him, with the audience clapping hands in unison, was a sight to behold. It conveyed unity and harmony. This impromptu performance sparkled the attendees, ranging from 6-month to 94-year olds. It was, without doubt, the highlight of the evening. 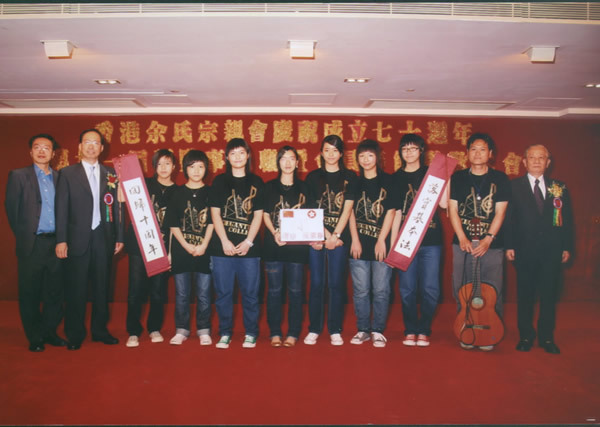 Recipients of 2007 scholarships were Michael Fan（范凱靜）, Abigail Yee, Christina Yee, Emma Yee, Kevin Yee （余健輝）, Melody Yee（余誠娟）, Michelle Yee（余美心）, Theresa Yee（余穎欣）, Yu Hoi Hao（余凱豪）, Lucinda Yu（余西好）, Michael Yu（余建豪）, Peter Yu（余建威）, Michael Bruce, and Mathew Bruce. It was noted that none of the 14 recipients, typically second generation American born Chinese, could speak a word of Putonghua（普通話）, when asked to say a few words in Chinese. To that, the People's Republic of China Consular General Office immediately donated a $200 red packet to the Yee Scholarship Foundation as seed money toward encouraging our youngsters to learn their mother tongue. 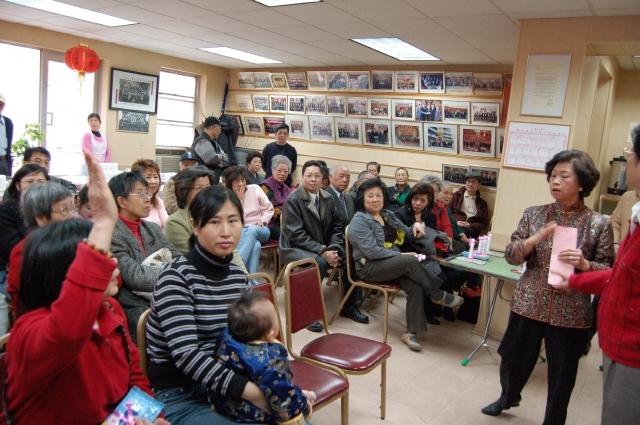 The Phoenix Yee Fung Toy Family Association has provided Computer Classes for all YEES. A staff of high school student volunteers led by Emily and Megan Yee, daughters of Mr.& Mrs. David M. Yee, accepted the challenge of teaching adult YEES about using the Computer and Microsoft Windows & Office software. A group of enthusiastic adults have participated in completing Computer Basics, Document Generation, File Management and Spreadsheet Organization. All have become comfortable with the new technology and its capabilities and functions. Computer Systems Hardware were donated by General Dynamics C4 Systems. We had eight (8) computer stations installed with on-line internet connection. The YEES were provided with a real hands-on experience as part of the learning process. A total six (6) computer classes were completed during the holidays in December and January. Computer Classes have been scheduled on one (1) Saturday each month beginning February 2007. Computers for YEES has been a successful program and will be continued as more YEES GO FOR COMPUTERS! 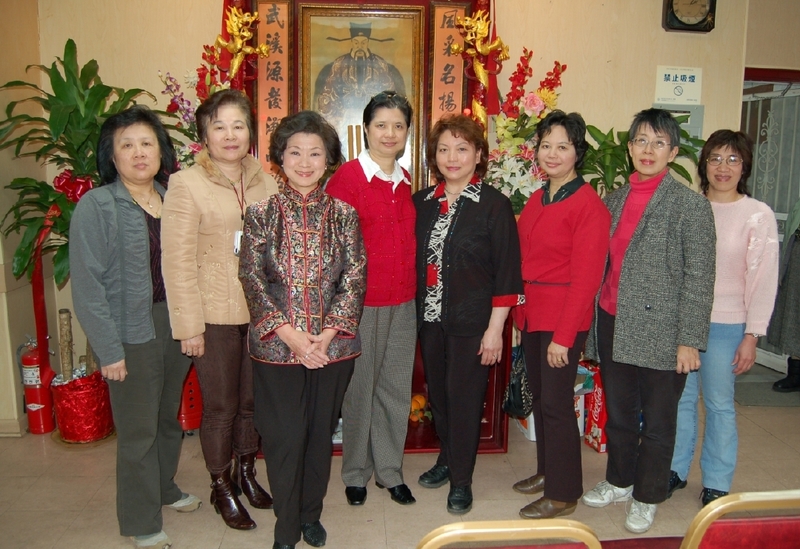 On March 4, 2007 the New York Yee Fong Toy Association Women's League celebrated its first 3/8 Women's Day. 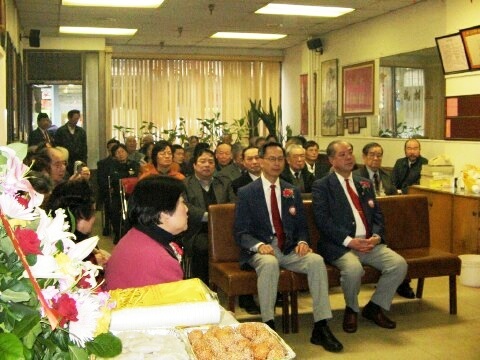 To commemorate this event, Grand Elder Peter, Grand Advisor John B., Advisor Hem Fook, Advisor Andy, President Kenneth, Vice President Gong Sum, Building President Frank, as well as other staff members joined this gathering. All women and members were invited to attend. President Kenneth kicked off the event by welcoming all the guests. Our Women's League President Kennie then took over. We began with a brief ancestor worship ceremony then followed by a questions and answers session and riddles for Chinese characters. People who gave a correct answer got a small prize as an incentive. We got overwhelming responses. Some women even brought their toddler along. 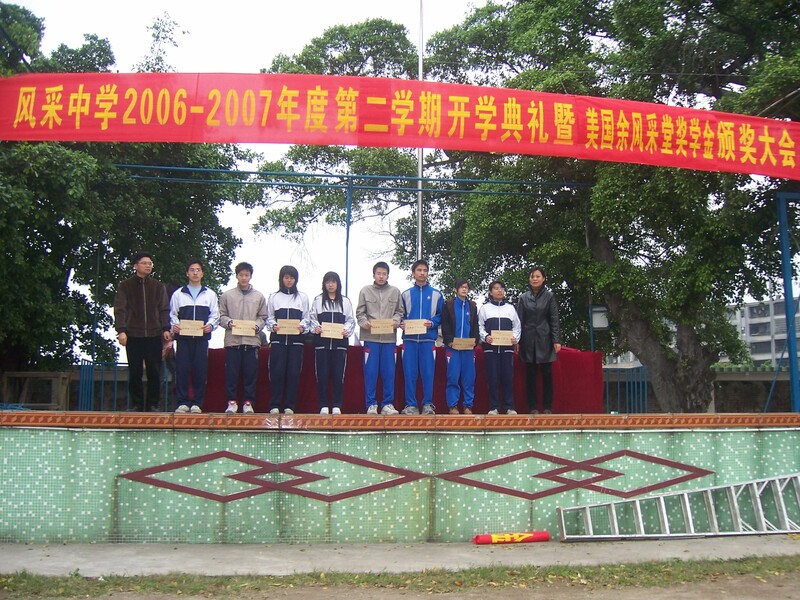 All were excited to receive prizes. Afterwards, we had a buffet luncheon for all attendees. Kennie then introduced the Women's League staff to everyone and thanked everyone for coming to show their support. Kennie did a remarkable job. I was really impressed with her performance. During the riddles session, she had subtly announced that she would be a grandmother soon. Congratulations, Kennie! With you as a role model, it will be like another "star is born". Gung Hay Fat Choy. 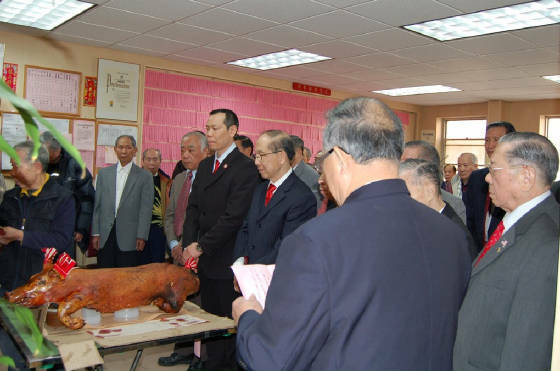 Happy, Healthy, and Prosperous Chinese New Year to all as we welcome the Year of the Golden Pig, 4705. 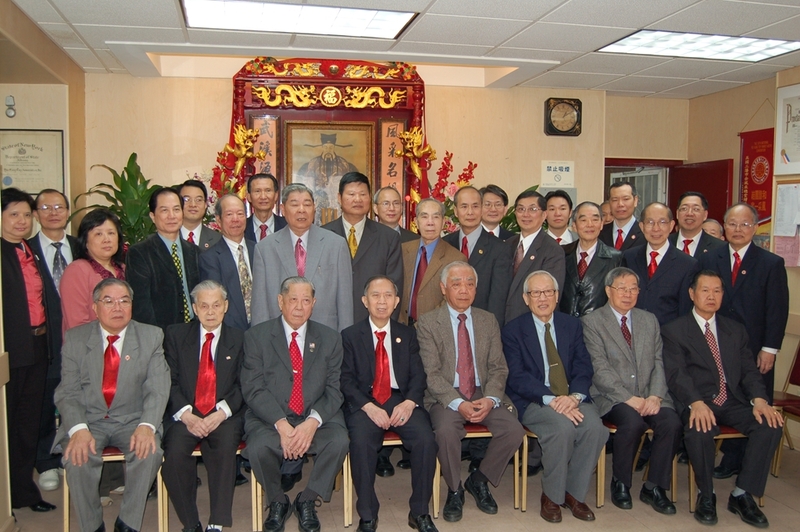 The New York Yee Fong Toy Association held its Chinese Lunar New Year celebration on Saturday, March 10, 2007. Shortly after noon, our cousins from the Boston Chapter, Ma and Tse Associations arrived at our hall and we began our celebrations. 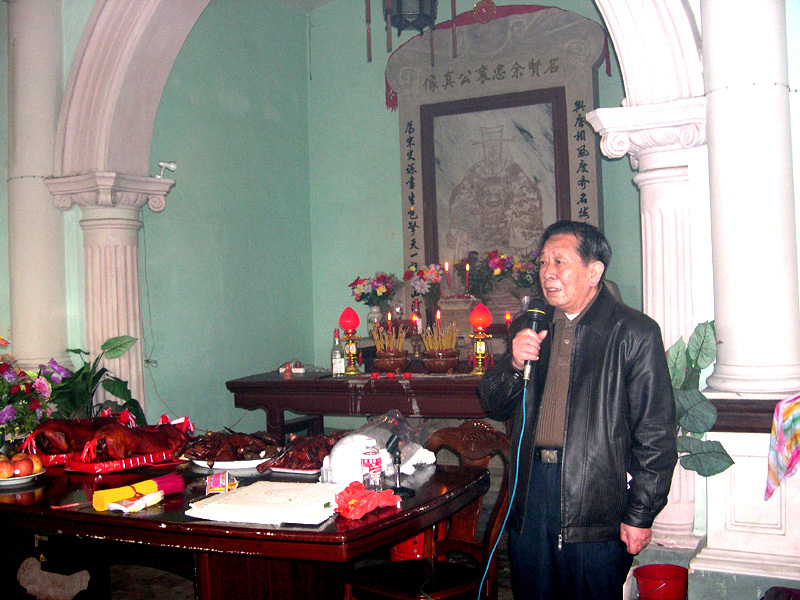 We started with the traditional ancestor worship ceremony, followed by greetings from our President Kenneth. After the usual formalities, we all enjoyed some time together and a buffet luncheon. 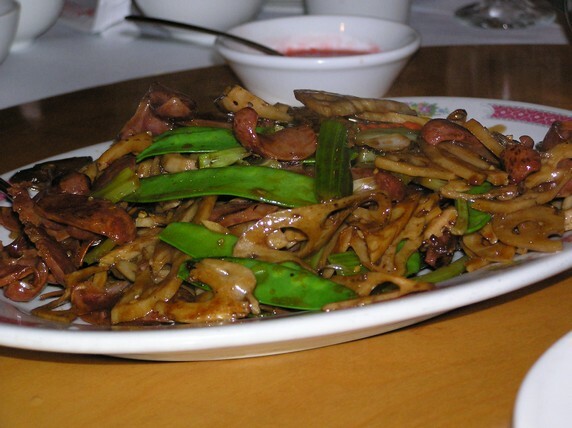 We then could not wait for the evening Spring Banquet to start at Jing Fong Restaurant. Our Master of Ceremony was again Kennie, who is also our newly installed Women's League President. Kennie welcomed everyone and introduced our President Kenneth. President Kenneth then welcomed all the attendees and introduced our VIP guests. He also announced that our newly formed Women's League is seeking more members to join and that we will be giving out prizes during a free raffle drawing. 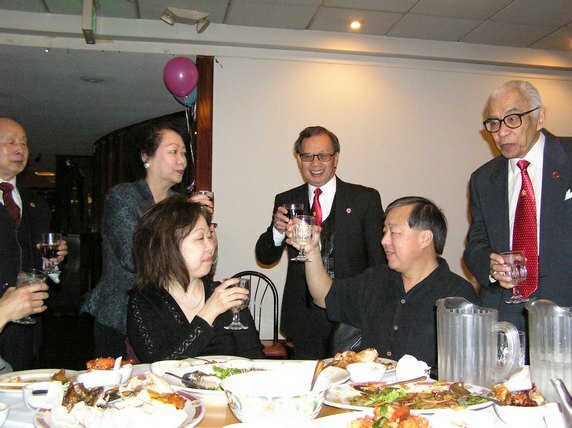 Congratulatory speeches were then given by Ambassador Andrew Hsi of the Taipei Economic and Cultural Office in New York and President of Chinese Consolidated Benevolent Association Eric Ng. We were also honored to have representatives of some public officials whom could not attend. Bronx Borough President Adolfo Carrion, Jr. had his General Counsel, Ms. Lai Sun Yee, presented our Association with a Proclamation acknowledging that we "Promote the Righteousness of our Past Generations and Nurture the Integrity of Our Future Generation". New York City Comptroller William C. Thompson, Jr. had Legislative Assistant Ms. Sandra Ung presented us with a Commendation for bringing together families, neighbors and communities. Assemblywoman Ms. Ellen Young, the first Asian woman elected to NYS Assembly, sent Community Representative Gilbert Hoe to present us a Citation for our dedication to the community. 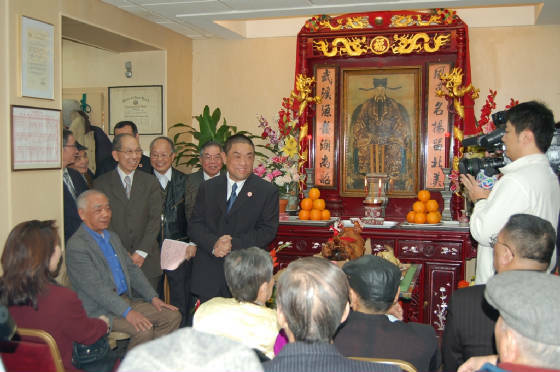 We were also grateful for City Councilman John Liu taking time from his busy schedule to extend his good wishes to all. Likewise was Federal Judge of Eastern District of New York, the Honorable Dora Irizarry, who extended her best wishes for the New Year. This was truly remarkable that we had so many dignitaries who could attend our New Year celebration. 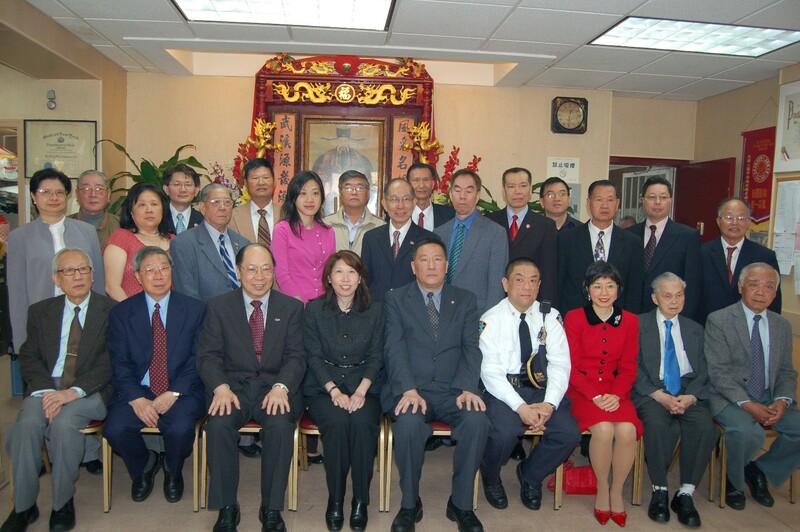 Deputy Inspector Gin Yuen Yee, the new 5th Precinct Commander, also made time to attend. In recognition of his achievements, our Association honored him with a special award. Our new format this year made our Spring Banquet that much more memorable. Besides the Women's League debut, we added a new level of excitement with 28 prizes from our free raffle. Although most of the gifts were from our Association, some were private donations. We want to thank Kathy Design, Ltd., Dragon Palace Restaurant, Jing Fong Restaurant, Helen Yee, Mr. & Mrs. Frank Yee, Mr. & Mrs. Kenneth Yee, Mr. & Mrs. Gong Sum Yee, Mega/Merica School and White Swan Bakery for their generous gifts. The Women's League did a great job conducting the free raffle drawing and providing each attendee an info handout with a $30 discount to a spa salon to attract new members. We also had performers doing their dance routines and a DJ who sang and performed in a unique style. We even had a small dance floor available for guests to do their fancy footwork. 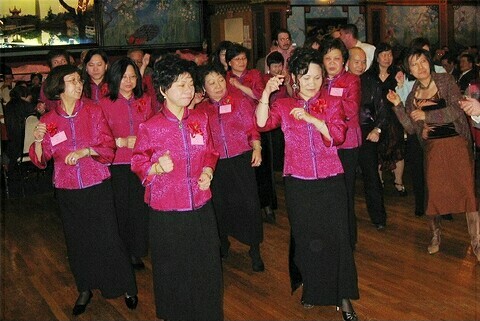 A small group of women representing the Women's League also performed some Chinese Cultural dances. This was a thumb up evening and the food was great too. It was encouraging to see that most of the over 800 attendees stayed until 11pm. For those who miss this event, we urge you get your tickets earlier next year. We want to again thank Kennie and her Women's League for their support. They took charge of the raffle, keeping track of the prizes, wrapping, decorating, and distributing all the tickets. Often many of these little details go unnoticed. They also helped as greeters. 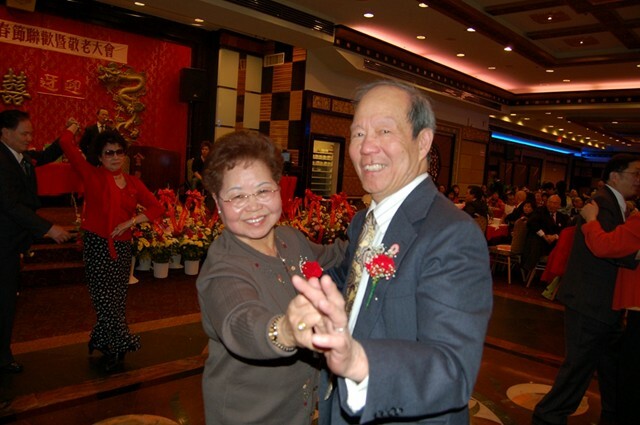 We also want to give credit and thanks to Jim Yee and Martin Yee from Vancouver for helping with the production of a Special Issue of the Yee Family Global Village Voice e-newsletter for the New York's Spring Banquet, distributed at each table. Printing and collating were courtesy of Andy Yu and me. Once again thank you all for making this year another joyous event and hope to see everyone next year. For more Spring Banquet pictures, please visit our site. 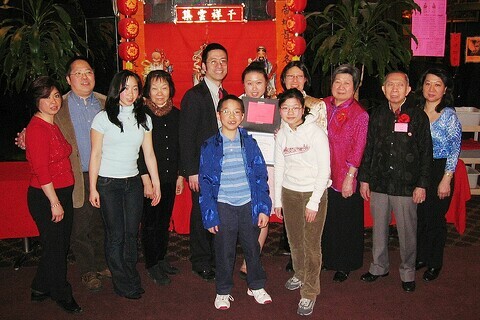 The Phoenix Yee Fung Toy Family Association hosted its 2007 Spring Banquet at the Great Wall Restaurant. Over 400 guests, family and friends enjoyed an evening of fun, food and entertainment. 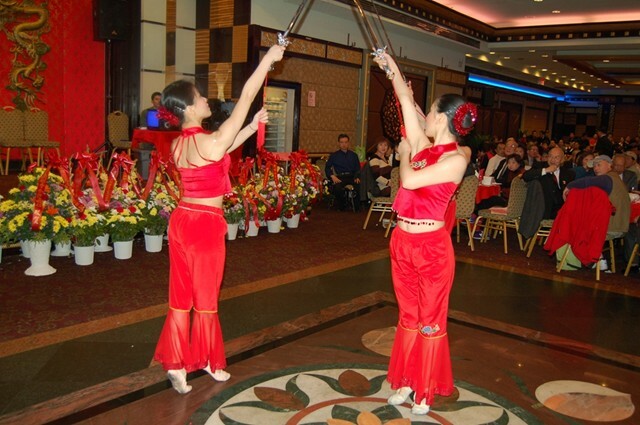 This is the largest spring banquet event in the Phoenix Chinese community. 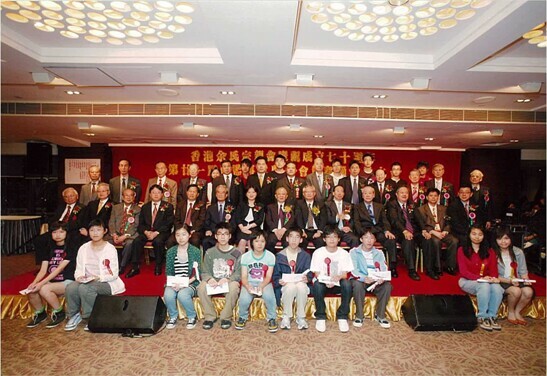 Scholarship awards were presented to outstanding students of Chinese school, elementary, junior high and high school. Chinese School tuition scholarship awards went to Derek Yu, George Yu, John Yu, and Matthew Yee. Jr. High scholarships were awarded to Colin Albert Yee and Nathan Yee. 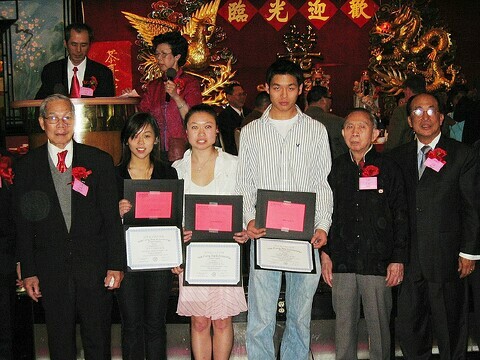 High School graduate scholarships winners were Brenton Dong, son of Michelle Yue Dong and Reicher Dong,; Eric Yee, son of Garle and Jolene Yee; Michael L. Ong, son of Mary Yee Ong and Victor Ong; and Darrin M. Yee, son of Larry and Joanie Yee. All Scholarship awards were judged on academic achievements, community service, citizenship, and extra curricular activities. Each high school graduate shared their plans for the future. They expressed their sincere gratitude and appreciation for the support of their proud parents and the Phoenix Yee Fung Toy Association. 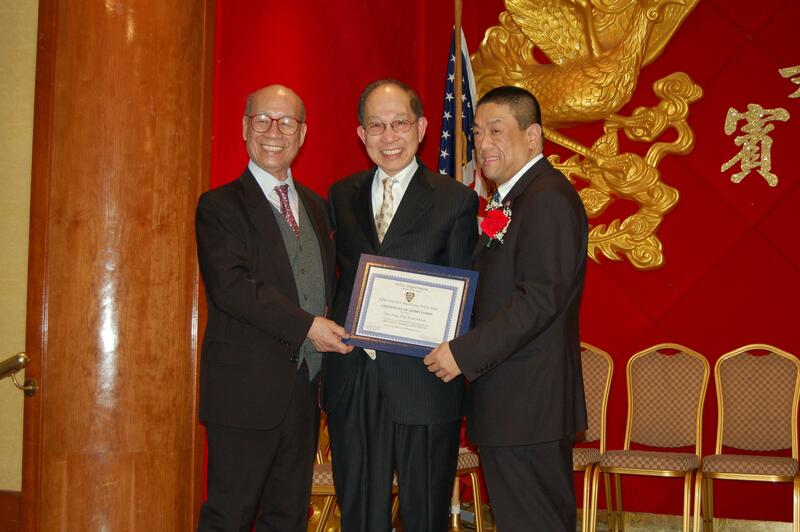 Mr. Alan Yee, Western Region National Grand Vice President, and L.A. Yee Fung Toy Senior Advisor Mr. Robert Yee presented a special award. 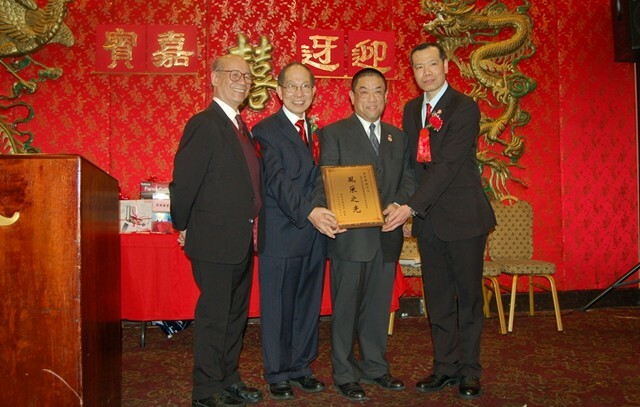 This award was presented to Worldwide and National Grand Elder John M. Yee for his dedicated effort in the planning and organization of the World and National Yee 2006 Conventions held in Monterey Park, California. Entertainment highlight of the evening included a special performance of songs from classical Chinese Operas sung by Mr. and Mrs. Alan Yee and Mr. and Mrs. Robert Yee of the L.A. Yee Fung Toy Association. Their singing was enjoyed by all who attended the event. 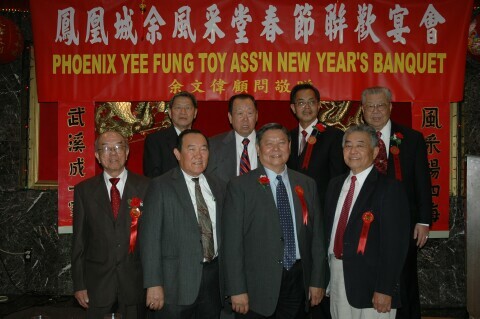 The 2007 Yee Fung Toy Association officers are President Benny Yee, Vice President Rudy Yee, Treasurer Doon Yee, English Secretary Jack Yee, and Chinese Secretary Kim Hong Yee. 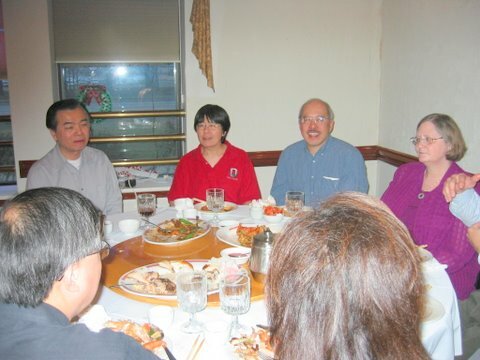 A banquet was held at Rice Bowl Restaurant, 2378, Florin Road on Sun, March 18 at 6pm. Over 400 people attended and enjoyed another wonderful multi-course dinner. 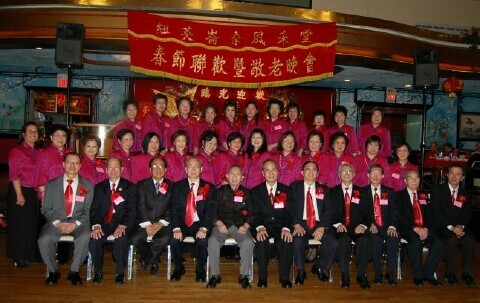 Members from the Yee Fung Toy Regional Headquarters in San Francisco, Yee family members from Stockton, and members from the Ma Family Association also attended. 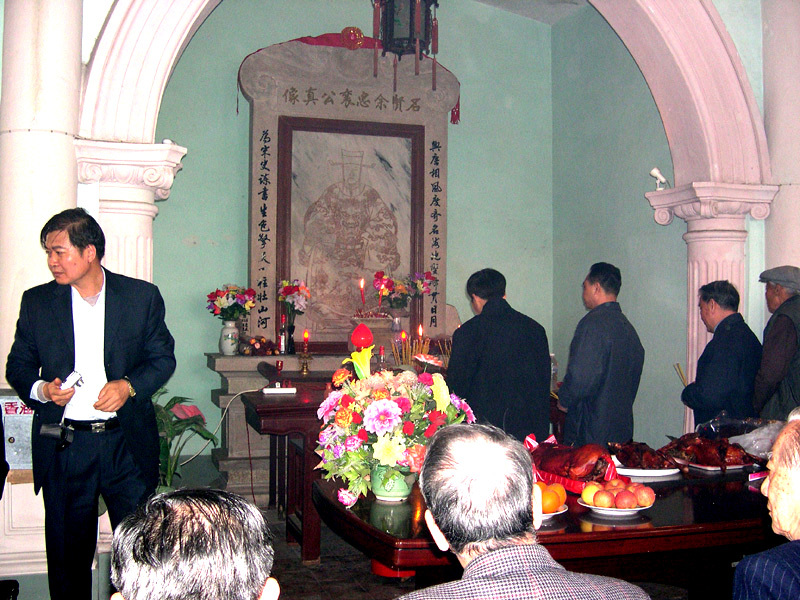 Earlier in the day, the association paid respect to the ancestors. 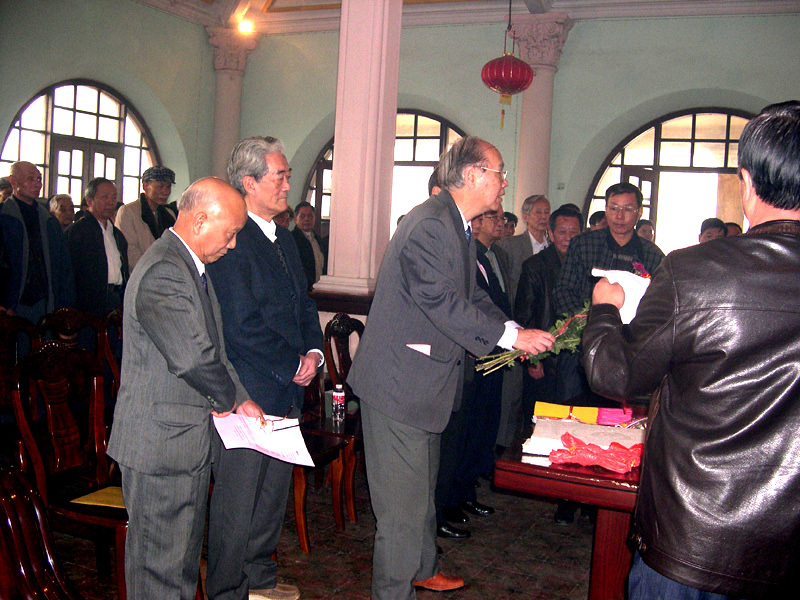 Lucky money was presented to the association's elders. 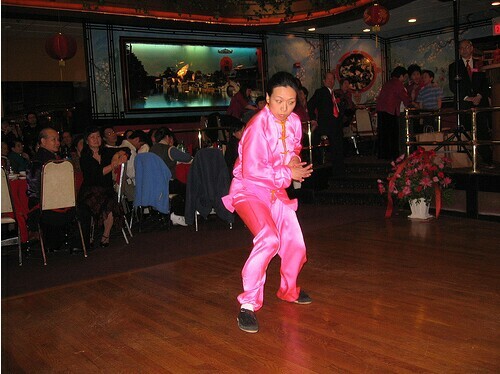 Yee Fung Toy Association of New England celebrates their Spring Festival as a dinner/dance and musical extravaganza. Although there was a spring storm that yielded three inches of snow only three days earlier, on Saturday March 24, 2007 was a nice relatively warm, sunny day. 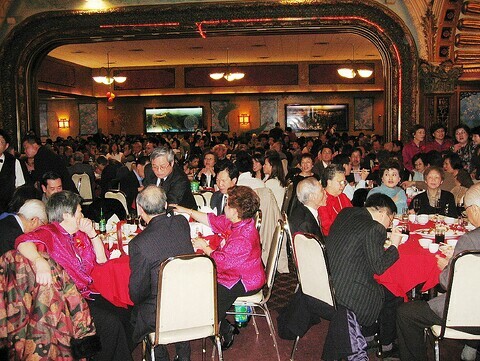 On this evening, the Association reserved the Empire Garden Restaurant for sixty-five Tables and over 600 people attended the 2007 Festival & Senior Appreciation banquet. Melinda Du, speaking Chinese, and Winston Yee, speaking English, served as bilingual co-emcees for the event. At 7:15 pm, the function officially commence with our Women's Group, accompanied by a few men members, sang two songs expressing New Year's greetings and well wishes to everyone. The Songs were followed by another group of members performing two line dances for everyone's entertainment. We were next honored to have one of our own member, Mai Du, perform two Wah Lum Praying Mantis Martial Art Forms. Mai is a very talented individual who was a past receipient of our scholarship program, works with the American Red Cross, and, as a certified instructor, operates her own Wah Lum Martial Arts Academy in Malden, Massachusetts. Yim Yu, our president made his welcoming remarks and well wishes to all our family, friends and guests who attended the banquet to have a healthy and successful New Year. 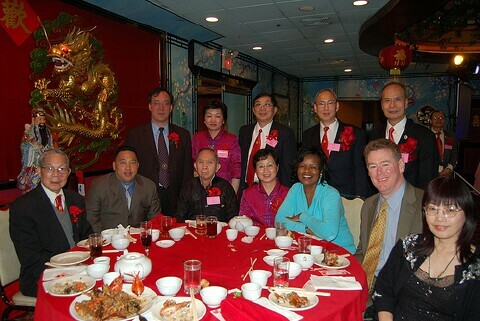 Our many special guests included CCBA President Michael Wong; TECO Director General and Mrs. K. T. Yang, Chinese Cultural Center Director Kelvin Ko, MA State Senator Dianne Wilkerson, Quincy Mayor William Phalen, and Boston City Council candidate Bill Linehan, who also participated in karaoke and sang "Heartbreak Hotel". Ho Lee Yee, our vice president then gave the thanks and appreciation remarks to all our guests and community leaders for attending this banquet and their continual support of our family association. He also congratulated the New York Association on their successful formation of their Women's League. As part of the evenings activity was the monetary donation in support of the Golden Age Center, Kwong Kow Chinese School, and Chung Wah Chinese Academy. 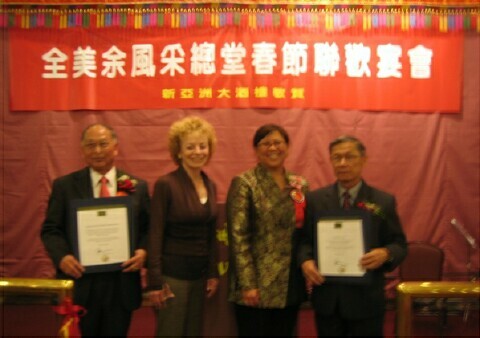 Scholarship money to help encourage the youth of Yee families to study Chinese was also awarded to the two schools. Catherine Yee. 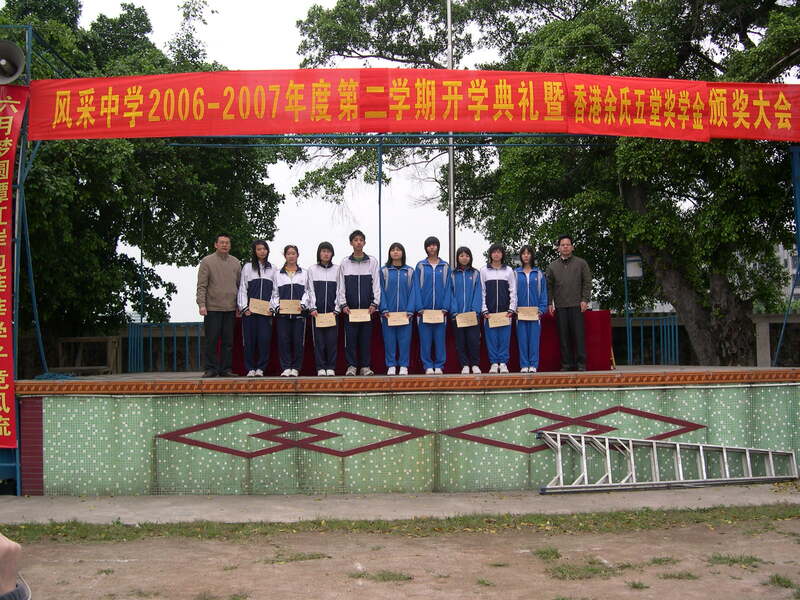 Xia Ying Yu, Tiffany Yu, Jeannie Yu, Lisa Yue, Adriana S. Yu and Peng Yao Wu. Our association, along with donations from friends, was able to give out almost 40 lucky drawing prizes this year that included gift items, gift certificates and 5 cash prizes with the top prize of $300.00. 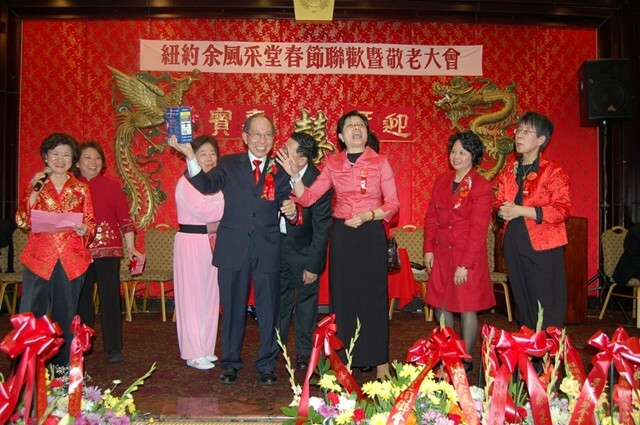 The Boston Branch of the Yee Fung Toy Association has proven to be a very talented group. 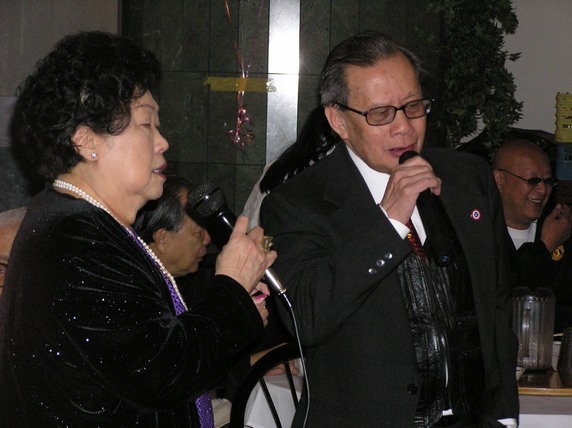 Our recreation director Yuen Bing and her husband Jack Yu, who also MC the entertainment portion of the event, set up great program with a variety of music for many, many of our members to participate in singing karaoke, and ballroom dancing. The evening was so entertaining and fun filled that the guests didn't want it to end. However. all good events must come to a close and at 10:30 peopple started to leave and the song, the Last Waltz, was played and danced at about 10:45. For more Spring Banquet pictures, check out Peter Yee's Picture Gallery. 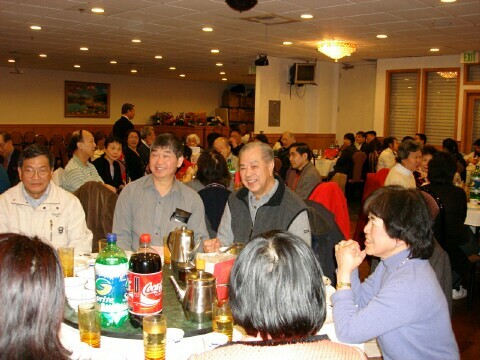 The Detroit Yee Fung Toy Association Spring Banquet was held on Sunday, March 25th at the Golden Harvest Seafood Restaurant in Warren, Michigan at 6 PM. The early hour was chosen to allow those of us who had to work or go to school the next day to attend. We had a small gathering of about 70 association members and friends. 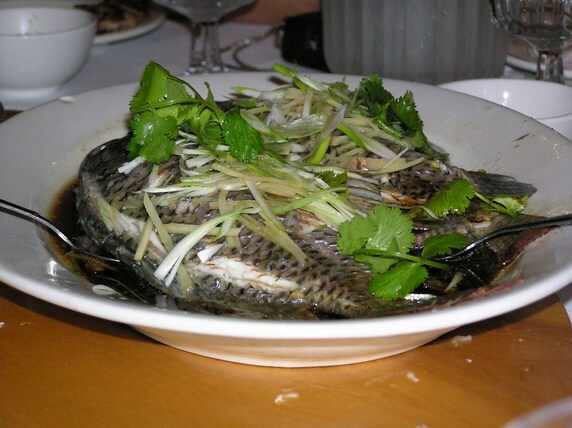 Everyone enjoyed a banquet which included entrees of squab and jellyfish, shrimp, steamed tilapia, lobster, pork, and roasted chicken. Afterwards, we enjoyed some karaoke entertainment. Below are some pictures from our Spring Banquet. Photos courtesy of Cathie Agacinski and Tom Lee. 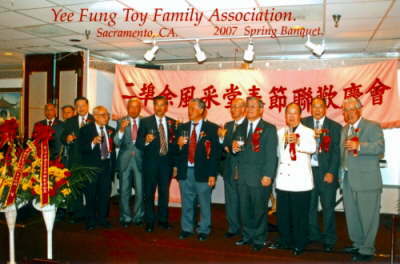 The San Francisco Yee Fung Toy Family Association celebrated 2007 annual spring banquet on Sunday, March 25th at New Asia restaurant and Y' Ben House. WOW! 1,250 community leaders, family and friends joined the Yee's in celebrating our dinner. 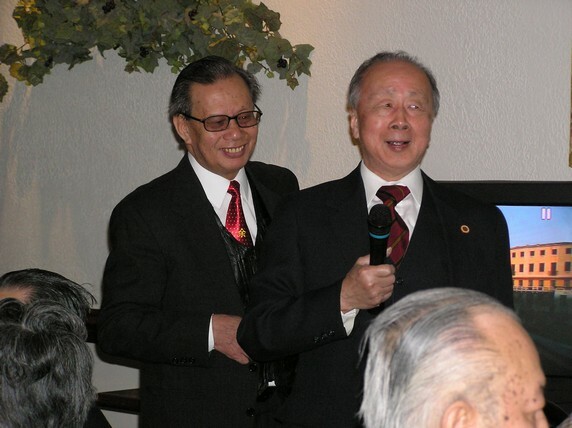 President Phillip Yee thanked everyone for coming to our annual Yee's banquet and wished everyone a great year. 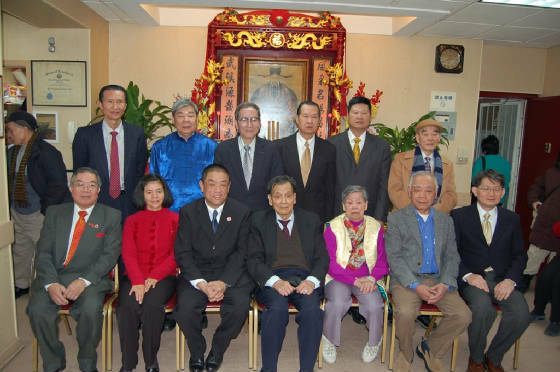 Western Grand President Joseph Yu thanked all the community leaders and wished everyone a healthy and peaceful year and may everyone continue to be successful. Special guest speakers included State Senator Leland Yee Ph.D., the first Chinese American ever elected to the California State Senate and to serve as California State Senate Assistant President pro Tempore. Our state senator thanked everyone for their support and help in getting him elected and wished everyone continue health, prosperity and world peace. Also in the house was our newly elected California Board of Equalization member, Betty Yee who also thanked everyone for supporting her and wishing everyone a happy new year. 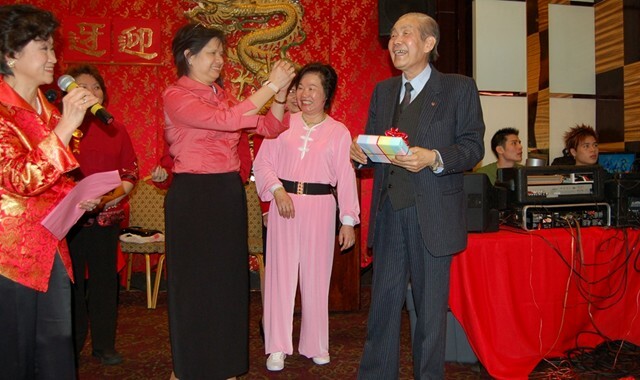 San Francisco school board member Norman Yee was very happy to join the Yee's banquet this year due to the fact that in December 2006 he was hit by an car and is recovering nicely. Special quests included our good friend, California State Senator Carol Migden who represents the eastern half of the San Francisco and the Marin County area. 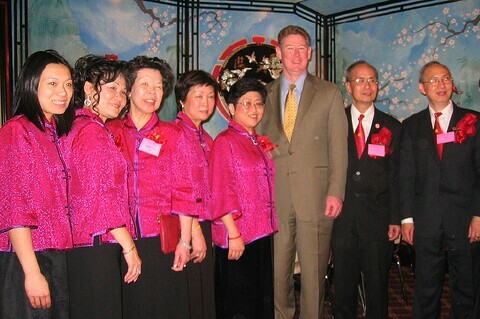 She appointed Betty Yee as acting California Board of Equalization member in December 2004. 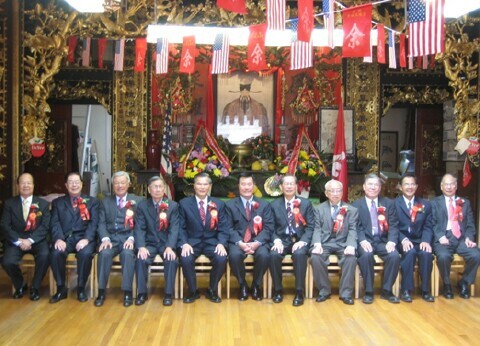 Other special guests included former Assemblyman Lou Papan, his daughter Gina Papan, Millbrae Councilwoman, Millbrae Planning Commissioner Wayne Lee and Millbrae Mayor Marc Hershman. The Yee Fung Toy musical group led by Gene Yee sang and danced the night away. Yes, there was even line dance from our musical group, first time that I can remember it ever happening. Closing out the entertainment was Vice Grand President Allen Yu from LA singing his heart out and rocking the house. 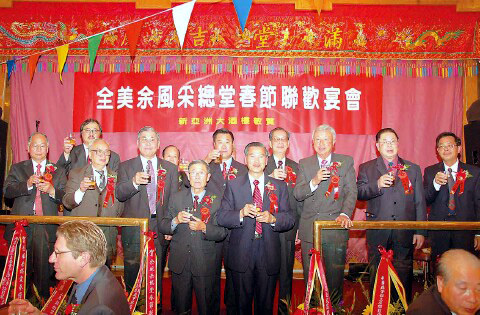 On April 21, 2007 all area Yee's gathered at the Phoenix Yee Fung Toy Association Building to celebrate the 18th Anniversary of the completion of the Yee Fung Toy Association building. A ceremonial service of thanks giving in memory of our virtuous ancestors began promptly at high noon. Over 100 fathers, mothers, sisters, brothers, aunties, and uncles rose in reverent memory to pay homage to our supreme ancestor Yee Chung Sheung. The service was traditional and dignified. 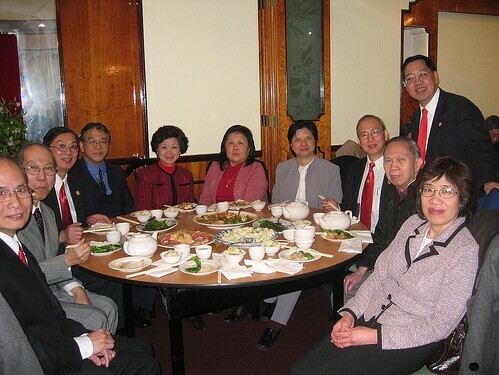 After the service, the Yee members enjoyed a delicious buffet lunch prepared by the Phoenix Yee Family Woman's Department. These hard working ladies presented a delicious assortment of entrees, dim sum, "Hom/Hem" Chinese and American pastries and yummy desserts. 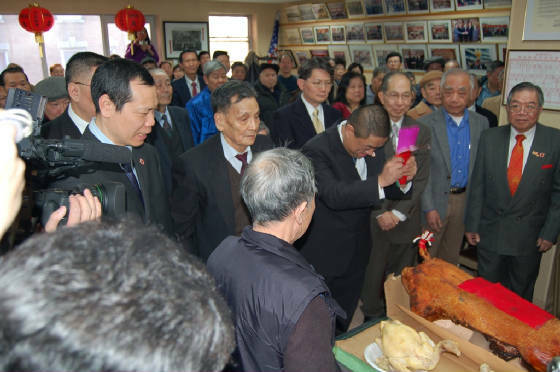 In accordance with the custom of the Home Village, Heung Ha, each Yee celebrant received a portion of roast pig...for a "little piece of home". 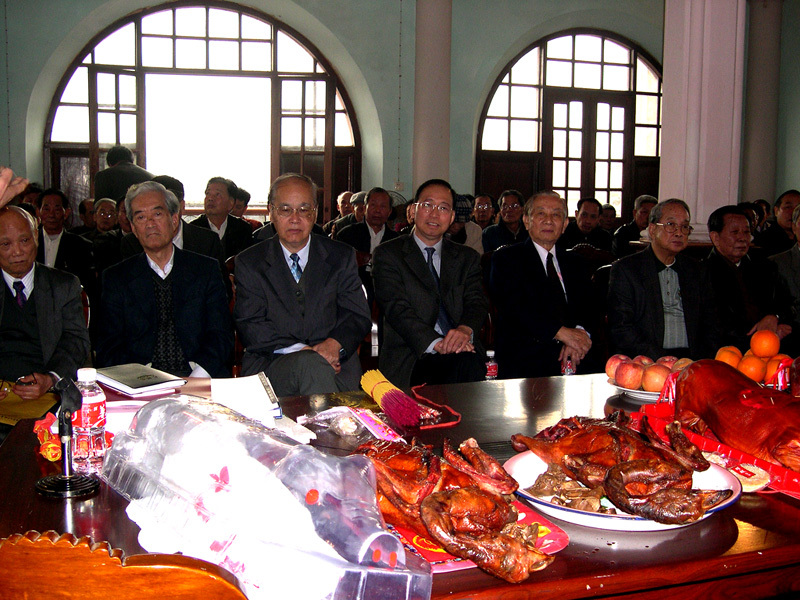 A total of six roast pigs were provided by the Association and individual Yee members. 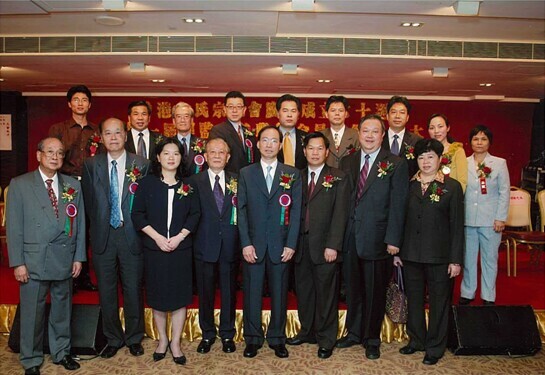 The Hong Kong Yue's Clansman Association held their Spring Banquet at the Metropol Restaurant on Sunday, April 15, when they celebrated their 70th anniversary, announcement and inauguration of their 21st Yue's Clansman Association Board of Directors and Officers, and presented scholarship awards. 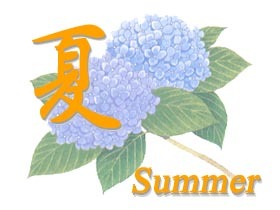 For a detail report from the Fung Toy Monthly, Summer issue #84, please click here. 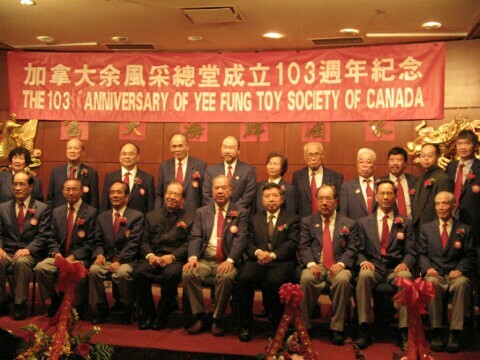 Edmonton Yee Fung Toy Society and the Fung Toy Athletic Club held their 3rd year anniversary spring banquet on May 12th at Century Palace Restaurant. Friends and many people attended, filling 38 tables. The Master of Ceremony, Eric Yu, hosted this momentous event. Noteworthy speakers included the Edmonton Chairman Frank Yee and Athletic club president. 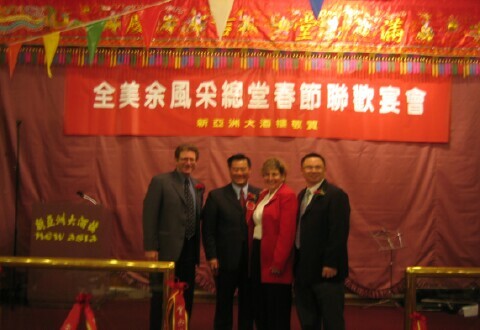 Calgary's Chinese Ambassador Cheng Hong and Canada Chairman Kan Yu were also guest speakers. With ten people from Vancouver, and another forty from Calgary, this event was much more than a city event. 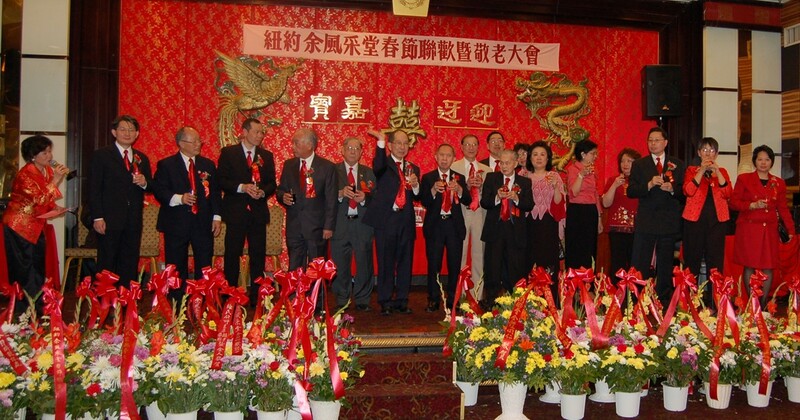 Though this event celebrates the Yee Fung Toy Society, the banquet was graced by the presence of the Mah旧 Society. Above delicious food, performance included an entertaining lion dance, and a fantastic collaboration by Edmonton and Calgary's Chinese opera. 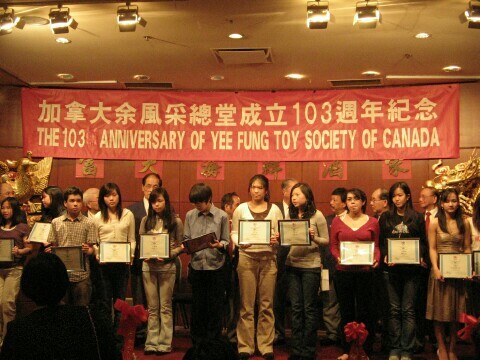 Within the banquet, Edmonton's Yee Fung Toy society also awarded scholarships to four gifted recipients. The vice president Ying Hua delivered the final address and thank-you's. This very successful banquet concluded with a prize draw with more than 50 gifts. 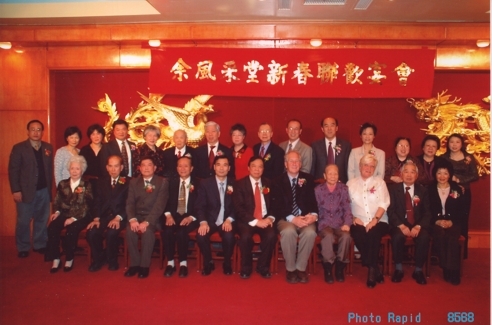 On May 20, 2007 the New York Yee Fong Toy Association hosted a luncheon for a very special cousin, Lai Sun Yee. Over 100 attendees came out to congratulate Lai Sun for her recent appointment, by New York State Governor Eliot Spitzer, as Assistant Deputy Secretary for Criminal Justice. 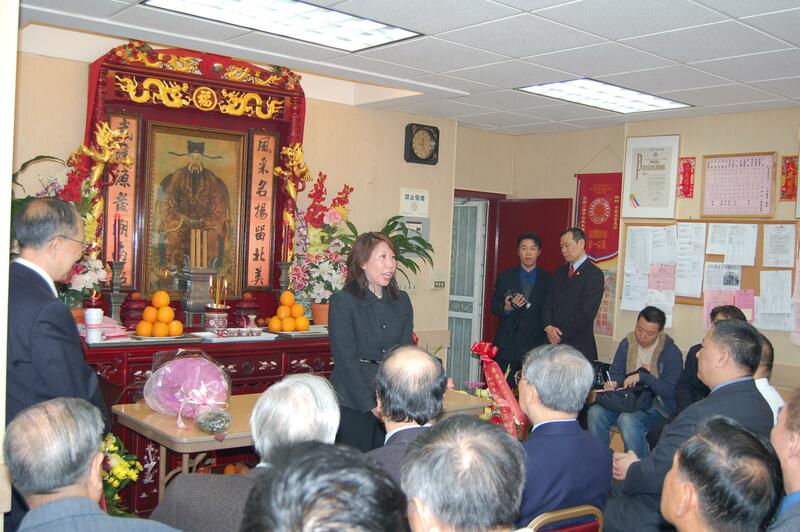 Our Yee family association was honored to have so many join Lai Sun as she pays homage to our Yee ancestors. 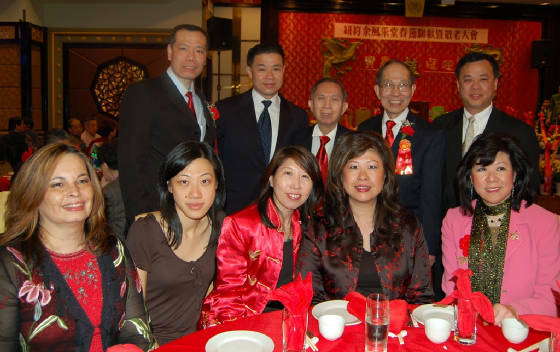 Among the guests were our cousins from the Mah and Tse Associations, CCBA President Eric Ng, Ling Sing Association President Justin Yu, Deputy Inspector Gin Yee as well as many others. 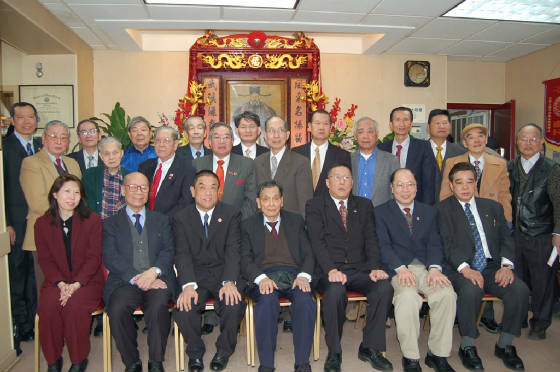 Our association is very fortunate to have Lai Sun join our family circle. As an attorney, Lai Sun is a very competent, educated and unique individual. She could easily excel in the private sector but chose to serve in the public sector. In doing so, she never lost sight of where she came from. 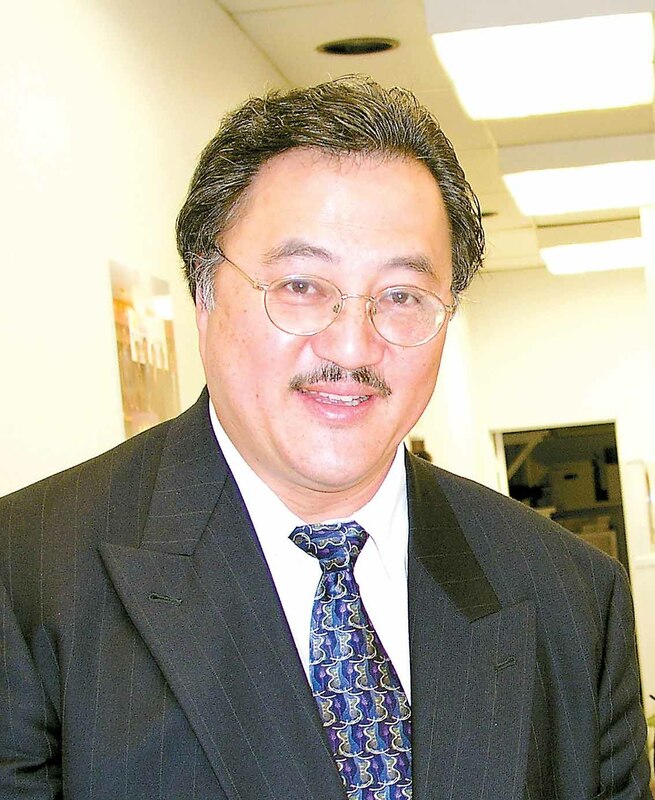 Besides working a regular job, Lai Sun is also very involved in the Asian American Bar Association of New York. As a past president of AABANY, she hopes her colleagues would join her in the belief that one should give back to the community whenever possible. She also hopes that other Asians would follow her example and take position in the public sector so they can make a difference. It is important that Asians have a voice in matters affecting Asians. We are also grateful that for the past few years, Lai Sun has been very generous providing us her valuable time in order to promote our Yee family association. I am certain this publicity will lead to good things for our association. Lai Sun, best wishes on your new endeavor. 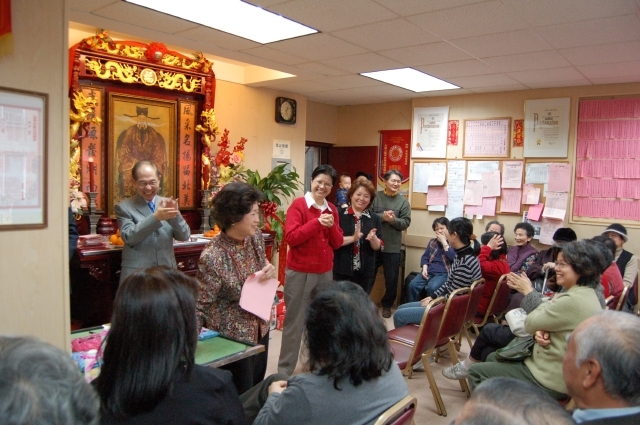 We also want to thank Justice Doris Ling-Cohan of Supreme Court of the State of New York, Sandra Ung from NYC Comptroller Thompson's office and June Jee, Director of Community Affairs, Verizon Foundation, for stopping by our association to join us to congratulate Lai Sun. Click here for more info on Lai Sun Yee. For a video news report by Sinovision please click here. 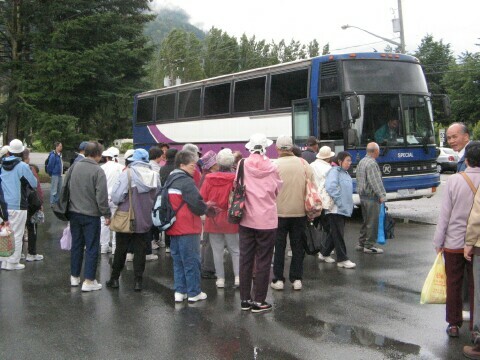 At 9:00 on a rainy Sunday morning on June 24, 48 of us boarded a Global Coach Line bus for a sightseeing tour that would take us from the Yee Fung Toy Building in Chinatown, traveling east of Vancouver along the Trans-Canada Highway (Hwy 1), to one of Vancouver's great escapes, Harrison Hot Springs. Harrison Hot Springs is just an hour and a half nonstop drive from Vancouver. Our chartered bus driver drove along the south side of the Fraser River, heading toward the Agassiz-Harrison turnoff (exit 135 - the Bridal Falls exit) east of Chilliwack and follow highway #9 north to Harrison Hot Springs. 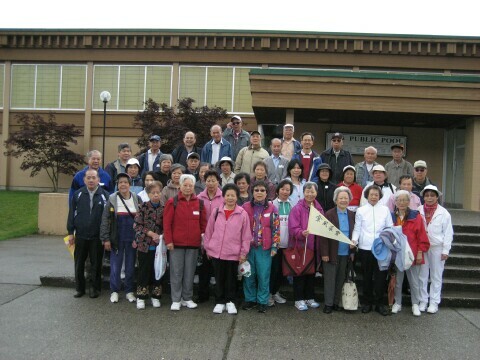 Most of us were seniors including some members of the Fung Toy Alumni Association. As we were on our way to the Harrison Hot Springs, we drove by the cities and townships of Burnaby, Coquitlam, Surrey, Langley, Abbotsford, and Chilliwack. Our friendly bus driver also doubled as our tour guide, giving us details of each city as we passed through them. We arrived at our destination around 10:30am and we spent the next three and half hours exploring the Harrison Hot Springs area under a cloudy sky with scattered sunny intervals and showers. Harrison Hot Springs is on the edge of southwestern British Columbia's largest lake, with sandy beaches, mountain scenery, and natural mineral hot springs. Harrison Lake also features a big swimming beach a short walk from the resort. In September, Harrison Hot Springs is hosting its popular annual event featuring the World Championship Sand Sculpture Competition on the beach. According to history, the hot springs were discovered in 1859 when paddlers capsized in winter and realized that the lake water was warm. There are two hot springs on the shores of Harrison Lake making it a very popular resort and health spa for the tourists. 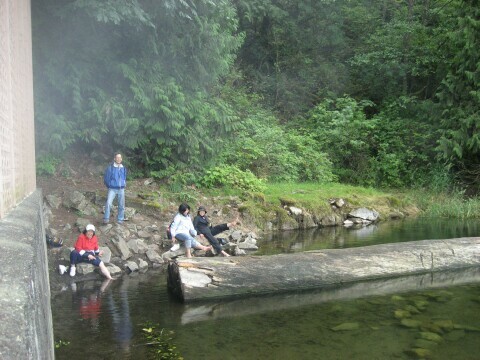 Long before miners "discovered" the hot springs during the gold rush of 1858, native Coast Salish peoples traveled by canoe to experience the healing benefits of the water. The Harrison Hot Springs area is known as the home of the legendary Bigfoot, also known as the "Sasquatch", a very elusive, giant apelike creature. Sasquatch has been quietly living and subsisting in the forests and mountain of the Pacific Northwest region of North America. However, most experts on the matter consider the Bigfoot legend to be a combination of folklore and hoaxes. We left Harrison Hot Springs at 4:00 PM; while we were on our way home our bus driver stopped by The Farm House Natural Cheeses, The Honeyview Farm and The Fort Wine Company for a brief Circle Farm Tour. We arrived back to Chinatown in time for dinner at the Park Lock Restaurant. Everyone enjoyed their day trip. Thanks to the Seniors Committee's Mr. and Mrs. Shui Chi Yu for organizing this event. The next issue of the Yee Fung Toy Global Village Voice will be published in mid September of 2007, featuring summer picnics and other activities at Yee Fung Toy associations around the world. Please submit your articles to the Editor via email (editor @ yeefungtoy.org) or postal mail (The Editor, 226 East Georgia Street, Vancouver, B.C., Canada V6A 1Z7) by August 15, 2007.